Windows/Operating Systems, which for FY13 made up approximately 24% of overall revenue. Server and Tools, which for FY13 made up approximately 26% of overall revenue. Enterprise/Business Products, which for FY13 made up approximately 32% of overall revenue. Entertainment and Devices, which for FY13 made up approximately 13% of overall revenue. Online Services, which for FY13 made up approximately 4% of overall revenue. It is important to realize that hardware products like the Surface fall under the Windows/Operating Systems division while products like the Xbox 360 fall under the Entertainment and Devices division. (Presumably other hardware, such as mice, keyboards, and cameras, also fall under the Entertainment and Devices division.) It’s also unclear where Microsoft’s recent acquisition of Nokia’s handset division will fall, but let’s assume that it will be under Entertainment and Devices as well. Consumer Products and Devices, which would probably make up approximately 9% of overall revenue. Developer Tools, which would probably make up approximately 13% of overall revenue. Enterprise Products and Devices, which would probably make up approximately 47% of overall revenue. Entertainment, which would probably make up approximately 13% of overall revenue. Online Services, which would probably make up approximately 17% of overall revenue. No matter how you look at it, the bulk of Microsoft’s income still comes from not just the enterprise but also software sales, and this really shouldn’t surprise anyone. So, now that the stage is set…what’s the future for Microsoft? Microsoft is becoming a consumer-focused enterprise company. iPhone, which for the 3 months ending 29 June 2013 made up approximately 51% of revenue. iPad, which for the 3 months ending 29 June 2013 made up approximately 18% of revenue. Mac, which for the 3 months ending 29 June 2013 made up approximately 14% of revenue. iPod, which for the 3 months ending 29 June 2013 made up approximately 2% of revenue. iTunes, Software, and Services, which for the 3 months ending 29 June 2013 made up approximately 11% of revenue. Accessories, which for the 3 months ending 29 July 2013 made up approximately 3% of revenue. From this, it’s pretty clear that Apple is a consumer-and-hardware-focused company. At this point, you may be asking yourself “Where is all of this going?” The answer to that lies in Microsoft’s shift in company focus. They are becoming more consumer focused, but what exactly does that mean? The biggest change (at least that’s been in the news lately) is the pending purchase of Nokia’s handset division. This, in combination with their Surface line of tablets and the Xbox, will put Microsoft squarely in the realm of a hardware-focused company in addition to being a software-focused company. That can (and most likely will) shift the revenue split to looking at revenue based on software sales (both consumer and enterprise) and also hardware sales (mostly on the consumer side). The Xbox 360, which runs it’s own proprietary OS. The Xbox One, which runs it’s own proprietary OS, a version of Windows running on top of the Windows 8 kernel and a proprietary “manager” OS which manages the other two. 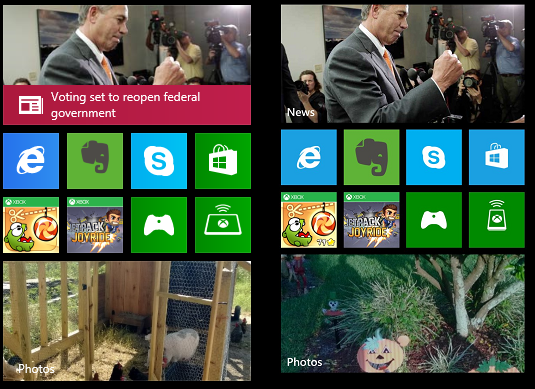 Other than a few variations (the Bing News app, the picture shown in the Pictures tile and the spacing between the tiles) these are identical. The one on the left is from my Windows 8.1 laptop (which looks the same as on my Surface RT) and the one on the right is from my Windows Phone 8 Lumia 925. This pretty clearly shows that from a consumer perspective, there really is no practical difference between how these two operating systems look and how you interact with them. From an app developer perspective, the story becomes even more compelling. Right now there are differences between the different operating systems, but those differences are shrinking. The user interface technology for both is XAML but there are different controls available and different user experience concepts. Some of the APIs available are the same while some are not. You can’t develop a Windows Phone app that can also run on Windows (either Windows Pro or RT). With each release of Windows Phone and Windows RT, those difference become smaller and smaller. Add to this mix the Xbox One, which will also feature a Windows-based operating system and the same “modern” (tile-based) user interface and the visible distinctions between the operating systems will become even smaller. Unifying the operating systems means one set of APIs and one code base to maintain for an app that can run on multiple devices. One code base means it’s easier to add features and fix bugs and that those changes become available on all devices at the same time. It also means a single app store, which will increase the discoverability and reach of your app and consolidate revenue and app profile management. Now, the choice of what devices an app is available on becomes a simple checkbox decision rather than a technical limitation. Ultimately, this means more apps available to consumers, which is always good for the app ecosystem. Microsoft is committed to the “modern” user interface paradigm. Microsoft is changing their release cadence (for all products, not just operating systems) to be faster and more modular. Microsoft is going to continue to unify their OS platforms both from a consumer perspective and a developer perspective. While this direction will certainly concern some people it will excite many others. Microsoft’s biggest failing has always been following through with a strong and sustained marketing strategy that presents a consistent view point and highlights what this unified and connected experience looks like and how it benefits consumers and enterprises. We’ve started to see some of this over the last few years, but it needs to continue and become more aggressive and consistent. In the long run, I think Microsoft will be able to pull all of these technologies and devices together into one seamless ecosystem. It isn’t going to happen overnight, but my prediction is that we will be there by the end of 2016. As both a consumer and a developer, I, for one, am excited about the future of Microsoft.